Where do I use my Pink Clove voucher code? Pink Clove aim to encourage body positivity and confidence with their selection of stylish, comfortable yet affordable plus size clothing. Embrace and celebrate your curves with dresses, tops, playsuits, jumpsuits, trousers, jeans, skirts, jackets and knitwear, available in sizes 16-28 and add a pair of stylish shoes to your basket to complete the perfect outfit. You can even enjoy a great sale section where there are tons of discounts to be made with up to 75% off a huge selection of clothing at Pink Clove. Whether you’re looking for figure hugging bodycon dresses for the evening, the perfect ‘nice jeans and a top’ combo for cocktails with the girls, or simply cosy jumpers for day to day life in the winter, you can find it all in the right size for you at Pink Clove. You can also browse through a new arrivals section where you’ll find all the latest plus size fashion and trendy footwear. Pink Clove has a fantastic blog section where you can find tons of style inspiration and fashion advice. Read through hundreds of blog posts and learn how to prepare for Spring weddings, how to build a versatile wardrobe, how to style your valentine's day look, plus size clothing, how to rock the hottest plus size fashion trends on Instagram and much more. Search through archives full of blog posts and filter your search to find information on selected topics of your choosing such as body confidence, autumn, punk grunge, sports luxe, street style, skint tones and much more. Available in sizes 16-28, the Pink Clove plus size dress collection is a curvy girl's dream with curve flattering, expertly cut designs, in the latest styles and prints. From plus size maxi dresses to midi dresses, bodycon dresses, skater dresses and occasion dresses - Pink Clove plus size dresses have got you covered for any occasion. Shop through the collection and discover occasion dresses, mini dresses, maxi dresses, black dresses, skater dresses, bodycon dresses, mini dresses, day dresses and even t-shirt dresses, all of which are extremely affordable and made with the highest quality and craftsmanship. Grab yourself a fashion steal with the Pink Clove plus size sale clothing collection. Get women's plus size clothing for less including the latest trends in dresses, trousers, jeans, skirts, tops and more. Every piece is expertly cut to flatter your curves and is available in an array of sizes, so no matter what your size, you can find bargain garments that fit right and feel comfortable. Browse through the sale section by feature, category, colour and size to find what you’re looking for, and if you can’t quite find the right piece or selection of clothing then check back another time and you’re sure to find something that’s perfect for you at a low price. Returns are simple, straightforward and free of charge for UK customers. Pink Clove guarantee to refund you any item you are not completely happy with. You must return your products in a saleable condition within 14 days of receipt. Please use the contact form to get in touch with Pink Clove. Pinkclove.co.uk is home to a fantastic range of women’s plus size clothing in sizes 16-28. 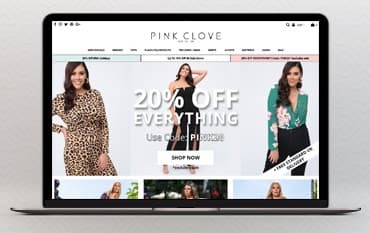 Pink Clove expertly design and curate plus size fashion to flatter fuller figure women and offer everything from the latest trends in dresses and everyday casual jeans to wide-fit shoes and stylish smart tops for effortless day to night styling. Shop online for plus size clothing at Pink Clove and use a discount code from us to save money on your order, allowing you to champion your curves and feel comfortable and stylish in figure flattering fashion, for less!